Good morning sweet friends! Day of Giving Friday is definitely on my mind – the winners list is current and a batch of cards is sitting on the credenza waiting to go out in the mail. Won’t you join us here? You can win this card. I have a fabulous new Quietfire Design sentiment to share – I will write peace on your wings and you will fly all over the world. I love this!! I think these are welcome words for a trying time in the world. Because every once in a while you deserve to throw together a simple card! It is indeed rare that I think of a card, sit down and make exactly from inspiration and it goes together as planned. I’m thankful that from somewhere – ease and simplicity found it’s way into my process, sometimes that’s what creativity writes on your heart. My desk didn’t even get messed. This is simple, on a background I mounted two Spellbinders Swirl Bliss Pocket die cuts – one and the top and one at the bottom with the opening towards the center. Inside I placed Spellbinders Oval Bliss with the sentiment stamped on Spellbinders Classic Oval LG. C’mon, I just know you have a sentiment laying around that deserves to be highlighted and sent on to someone to tickle their heart. For new readers, every Friday it’s my pleasure to give away a card. The card goes to a randomly picked reader (worldwide) who leaves a comment in our conversation. Want to know more about Day of Giving, here’s a link to my FAQ’s just check out #11. You can check to see if your name is on the list of winners HERE.! For your comment: What advice would you lend to someone who is discouraged? Accessories: Spellbinders Classic Oval LG, Spellbinders Swirl Bliss Pocket, Spellbinders Oval Bliss, Paper Source Double Sided Satin Ribbon – Pool. Button Have a fabulous weekend friends! I’ll be back soon. Beautiful card Becca and touching sentiment!!! Speaking from experience this past week and a half since my husband went to Heaven, give the person who is discouraged/hurting a great big HUG and tell that person they are loved by God and by you. It truly does make a difference! What a lovely card and a beautiful sentiment too. I live by the words, ‘what will be, will be’. They have served me well in my trying times. Hi Becca, another beautiful card , i so agree this sentiment is beautiful. I would say have faith and believe. What a gorgeous cardb you have today! I have my eye on that very sentiment from Suzanne’s latest release–just love it! What a gorgeous card and the sentiment is EXACTLY what I needed to hear today! More than you would ever know. I have alot of bad health issues attacking me all at once that are trying my soul. The pain is out of this world. So to see this today is just the precious reminder I needed to see that Yes, God does still love me! A friend encouraged me yesterday as I wept before her and gave me the shove I needed to get out of my Pity Party …or at least I am trying to…not easy when negativity and trauma are all you have known your entire life (44 yrs.). But through it all God has been so good to me. Gorgeous details on this pretty card! Wonderful card! I really love those Bliss dies! Yep, one look and my jaw dropped! Thank you for sharing! Hello Becca, beautiful card today. I would encourage someone to keep their chin up and take one day at a time, one hour at a time if necessary. i always tell someone that tomorrow will be a better day! To the discouraged put the full armor of God and do one step at a time! Fantastic and elegant card design. 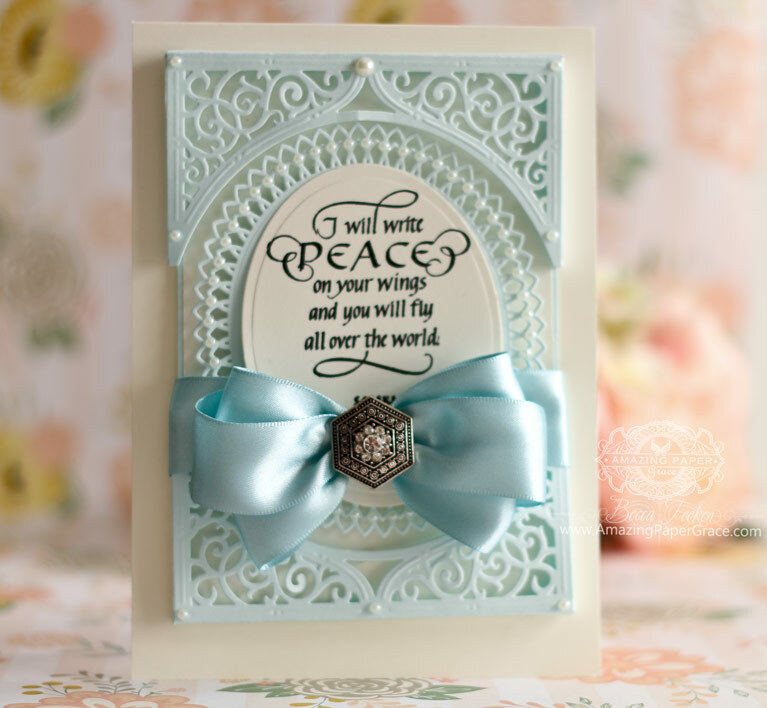 The arangement of Spellbinders dies are stunning with the bow and button.And the sentiment is so beautiful. And here I was, thinking I didn’t need that Swirl Bliss die. Now, after seeing this card, I HAVE to have it! What a great card – beautiful colors, beautiful layout. I just love it!! Thanks, Becca. well it would be wonderful if there was peace all over the world. Hello Becca! Your card today may have been simple but it looks elegant and very detailed. It is gorgeous and one b I am inspired to creatively borrow from you. Oh….oh…..oh…..! Simply breathtaking! The colour combination is superb. And that sentiment is just wonderful! My mother used to say that it is easy to look around and find people who are much worse off than yourself – and she wasn’t talking about finances! We only need to glance at the news on the TV and see the horrors and injustices around the world. As a Christian, I remind myself that this life is not all there is. Jeremiah 29:11 “For I know the plans I have for you,” declares the Lord, “plans to prosper you and not to harm you, plans to give you hope and a future”. What a stunning and elegant card, Becca! Beautiful colours. Love the sentiment you have used. It’s so sad that it’s impossible to buy Quietfire products in Norway. Gosh, in regard to advice for the discouraged…look no further than your blogs. 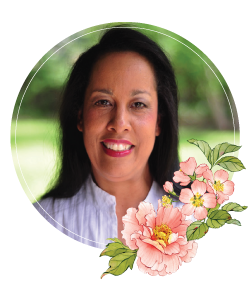 This is where I go for a spiritual lift – beautiful cards & sentiments, and connecting with like-minded generous women. It’s been so heart-warming to read the inspirational comments and seeing people reaching out to others in support. Encouraging others is always a healing antidote for discouragement. Becca your card is amazing – love the simple elegance and the colour is beautiful. I would hug them & tell then that I an there for you. Good morning Becca, another beautiful stunning card!!! I would just say I’m here for you anytime!!! Becca, a gorgeous card. So elegant. The sentiment is very special. Reading the comments above there are some simply beautiful words too. 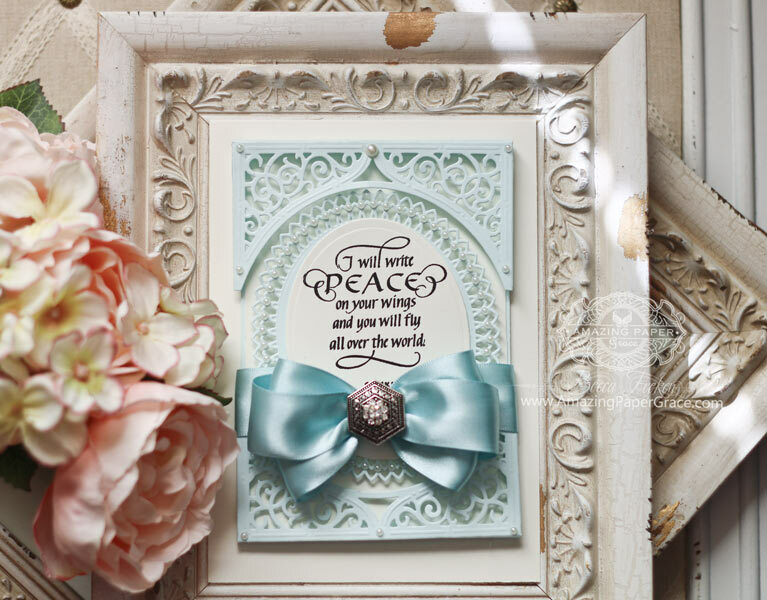 The soft colors and delightful framing make this card such fabulous eye candy to behold! 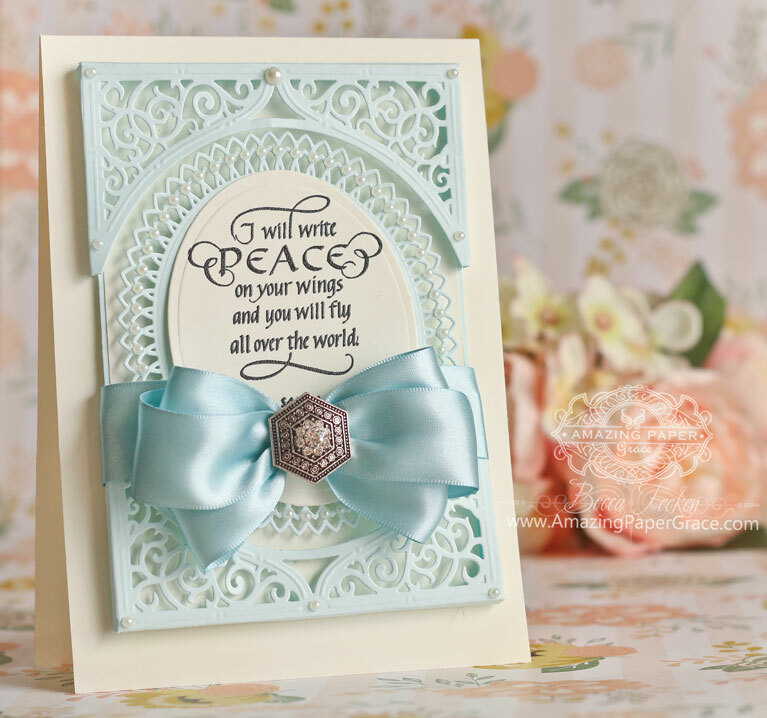 Morning Becca, A truly pretty card, I’m loving all the dies you have used and your compilation is gorgeous !! Once again Becca, you have created not only a beautiful card but a thoughtful one as well. I would love to wander around in your mind for a day, just to feel the creativity. Wow that is totally stunning, those dies are just gorgeous! !Love that button to top off the lovely bow! Beautiful Card Becca. Would not have thought to put these two die sets together, but the outcome is stunning. My advice: never give up, just means back to the drawing board for some tweaking before proceeding forward. Oh Becca, this is one of my all=time favorites! The color the bow and the great part is I have all the dies to make this one. Your bows continue to intrigue me. I have been able to make some pretty good ones since I have YOUR bowmaker. Just have to keep practicing. And that would be my advice to just keep trying and keep your chin up. Sometimes life seems hopeless; just pray and things have a way of correcting themselves. What a beauty of a card! Elegant and peaceful. Hya Becca stunning card as always !!! her Mum for support .